Tahini is something that has always been a part of my life given my family’s Greek origins. I was born and raised in Australia, but things like tahini, vine leaves and pickled turnips were as normal to find on the kitchen cupboard shelves as the vegemite was. My Dad’s tahini sauce is one of the first flavours I remember, which is a bit sad to think on at the moment as he passed away this March. My parents are now both gone and it leaves me cherishing memories like that. My Mother was the most incredible cook and I love having a stash of her recipes that my sister and I share, but I no longer eat most of the meals I grew up on due to food intolerances. I do however use a number of the ingredients in more, lets say creative, ways. Tahini is on the sometimes list for histamine intolerant types, but I still have it just about daily. I can’t say I’ve noticed it causes me any great issues, but I eat as low histamine as possible so perhaps that’s why. Tahini is made with one very simple ingredient…. sesame seeds. It is also high in calcium and a good source of protein. There are two types of tahini too, one is hulled, which is lighter in colour and flavour and the other unhulled, which is much darker and very rich in flavour. Actually there are three these days now I think on it. There’s also a black tahini that has a stronger flavour again. I love it, but not sure it’s for everyone. Whether to choose hulled tahini over the unhulled variety is an interesting question. Hulled means the husks of the sesame seed are removed while unhulled means they’re still intact. Unhulled tahini has something like 95 times more calcium than hulled tahini but oxalic acid is found in the husks of the sesame seed and it can inhibit the absorption of minerals such as calcium and iron. This makes some say that you may not even absorb much of that extra calcium and you’re better off with the small amount in the hulled tahini. We definitely know that oxalic acid binding minerals is true, but try as I might I can’t find any evidence to say the huge amounts of extra calcium in the unhulled variety remains unabsorbed. To make matters worse, some health professionals vote for the hulled variety while others vote for the unhulled. I think 95 times more calcium is a lot, and I think it’s difficult to believe that it’s all unavailable to us but I will certainly keep researching that one because if you’re eating all that calcium you want to be absorbing it! I have chosen the hulled tahini for this recipe mostly for taste purposes as the unhulled would be quite strong and far less sweet. When buying tahini my brand of choice is Mayvers. They are an Australian company that focus on providing wholesome food with good ingredients and I don’t think you can beat that. It’s also organic, so you can be sure there are no added nasties to be found in the product. Also, if you haven’t used tahini before, a quick tip is it needs a really good stir in the jar before use because all the oil from the seeds rises to the top and the paste sinks to the bottom. If you don’t mix it your first mouthful is likely to be mostly oil while your last will be quite gritty and thick. I stir mine every time I open the jar to keep it just right. 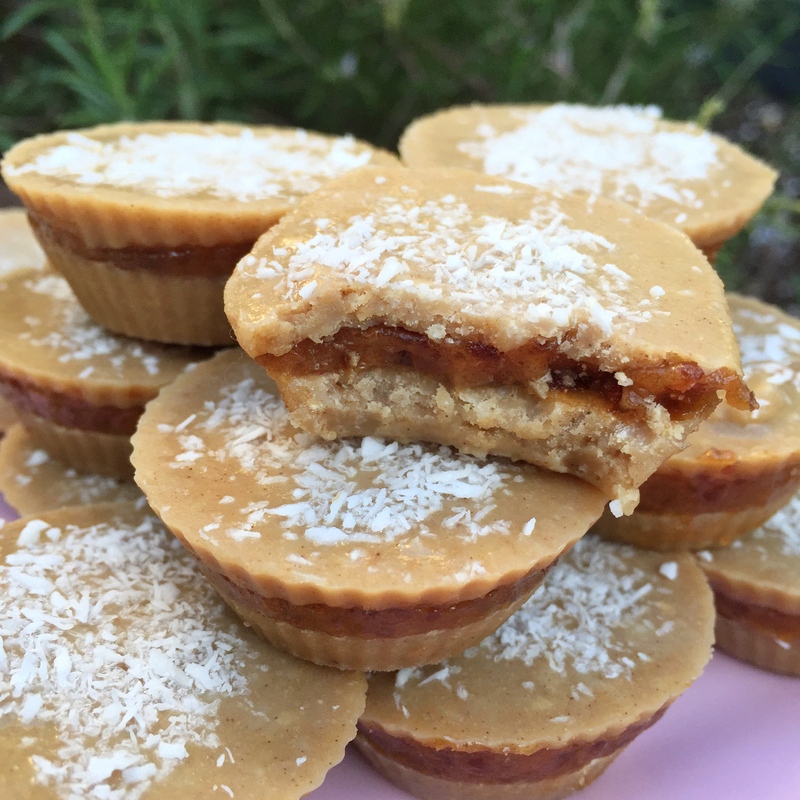 I took my inspiration for this recipe from a beautiful tahini cup recipe by This Rawsome Vegan Life that I found on Tales of a Kitchen. I couldn’t have the coffee cream filling, and wanted to have some coconut in there too so made a few amendments to suit me. If coffee is no issue for you then give the other recipe a try too, it looks lovely. Note: You can just soak the dates in warm water for 10 to 15 minutes if you’d prefer. If you do that you won’t need the boiling water when blending and they will cream up a little faster. I always seem to forget to do this and want to start the recipe. No patience, which is why I use the dates with boiling water! Once all the date mix has been added and smoothed out, pour the rest of the tahini mix over the top. If you find it’s solidified a little just put it back on a low heat for a minute. 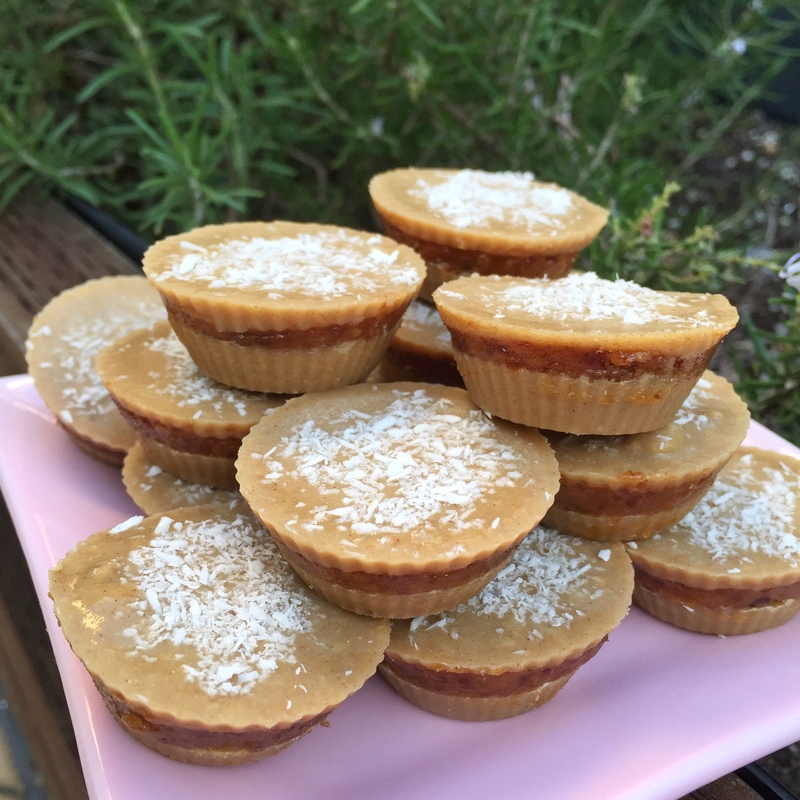 Once the last tahini layer has been added, sprinkle with some extra desiccated coconut, then put the moulds back in the freezer for 30 mins or until solid. Enjoy! * I thought it worth noting I’m not much of a silicon fan so use it as little as possible. It’s also worth noting that is a completely un-researched comment. There’s just something about cooking in it that doesn’t sit well with me so I need to do my homework there, which I will do. I’m less concerned about making raw treats in it but still don’t use it often there either. I love these! They look really tasty! Wow, this recipe sounds super easy and i am stoked to learn i have the same Tahini in my cupboard as the professional 🙂 Great little tips along the way, thanks, Gab, and i don’t need a thermie, Yay! They look amazing, th asks for sharing.